We received this story as an email, and feel that it clearly illustrates the state of roads policing in Britain today. I have just been unjustly banned for 42 days for travelling at 64 in a 30 limit. As with so many cases there was a simple explanation for me exceeding the speed limit to such a degree... I made an honest mistake. 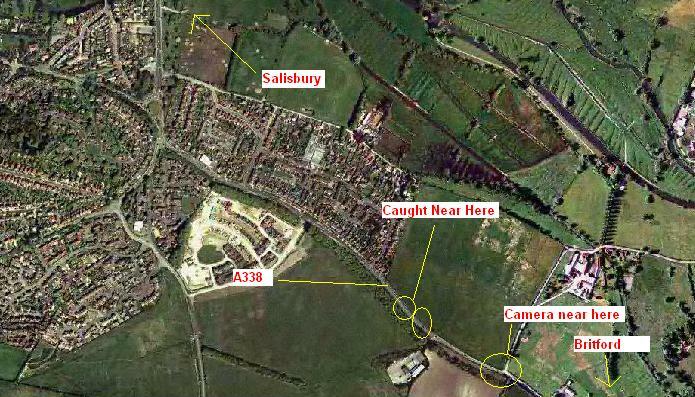 There is a stretch of road between Salisbury and Britford (in Wiltshire) on the A338, which is completely outside of a built up areas, with a wide road, fields on one side and a forest on the other. Only because it has Street lamps (set back from the road) is it a 30 mph limit. On Sunday 16th March myself and a friend were out for a lovely spring ride. We had our Fiancées on our motorcycles and were being extremely careful to observe the speed limits. I had had a clean licence for more than 10 years, and although I will not pretend that I have never exceeded the speed limit, I have always been proud that I am pedantically careful to slow down to the correct (or lower) speed when it comes to areas where speed could be dangerous. On this occasion there was no traffic, no pedestrians, good visibility, a dry road and therefore no danger to others and perceiving (though incorrectly) that we had entered a National Speed Limit, we accelerated to 60. Now although I was clocked at 64, I believe I would have been at this speed for no more than a second or two. My motorcycle was capable of accelerating from a standstill to 100 mph in just 6.5 seconds and it was very easy when accelerating to go just a little too far. The fact still stands, it was an honest mistake. We were both caught by a Laser camera in an unmarked van, My friend for 60 mph and me for 64 mph. Perhaps we were foolish not to exploit the loophole, but as honest citizens we felt we should do as we were told and sign the forms stating that we were the drivers. The irony being that those who had upheld the law all their lives should then be dealt with as we were. My friend was called to the Magistrates court a week before me. He was given an unholy telling off, a 28 day disqualification and approximately £300 in fines and costs. A week later and I was pleading my case in court. I told the Magistrate the facts mentioned above and I received a 42 day ban and £210 fine. I was insulted to receive a seemingly random ban. The company I work for went bust, and I am currently seeking work in an industry that requires me to have a driving licence. Although this was also explained to the Magistrate, it made no difference. My injustice is probably the same as is happening every day to thousands around the country. However, I am left feeling embittered at the British legal system. They have left me unable to gain employment for 6 weeks and wondering how I will pay my rent. They have turned me from someone who was proud to uphold the law into a person who realises he must simply manipulate it to his benefit, whether within it or not. Living in a city, I see acts of vandalism, theft and injury to others every day. The Police regularly tell me they haven't the time to deal with the offenders. I am left with unaffordable insurance and costs that will run into thousands (I have had to sell my bike at a huge loss). They now have £210 pounds to spend on Cups of Tea to toast their success. Another friend of mine has twice fallen foul of the "Speed Profiteers" in Wiltshire recently and awaits his fate. We have had enough. The news is full of Honest people talking of their hatred of a brutal system of "Safety Enforcement". The system is so obviously working against the people it is sworn to work for. Something proactive must be done. I will write to every law maker in this country if I have to, but I intend for these people to realise that Speed doesn't kill. Dangerous Driving kills.